Allow yourself an exotic moment of sublime pleasure. For you, a fresh shower of real coconut flakes on delicious milk chocolate, in a triumph of exquisite coconut cream held between light, crispy wafers. No other snack spoils you like this. A generous 250g bag with at least 65 bite-sized pieces or choose the 220g bag with at least 55 delicious bites. Relax the Italian way Relax and enjoy this speciality the unique pleasure of a creamy Italian cappuccino, wrapped in chocolate. The aroma and taste of coffee in an exquisite milk chocolate cream, with deliciously crisp wafers: treat yourself to a moment of real pleasure. Rose of The Dolomites Dark Noir 150 gr. - Loacker 7,60 EUR / 5,07 €/100 gr. Wafer Classic Milk 175 gr. - Loacker 2,55 EUR / 1,46 €/100 gr. Wafer Speciality Fondente - Dark Noir 150 gr. - Loacker 2,55 EUR / 1,70 €/100 gr. Wafer Classic Napolitaner 175 gr. - Loacker 2,55 EUR / 1,46 €/100 gr. Wafer Classic Vanille 175 gr. 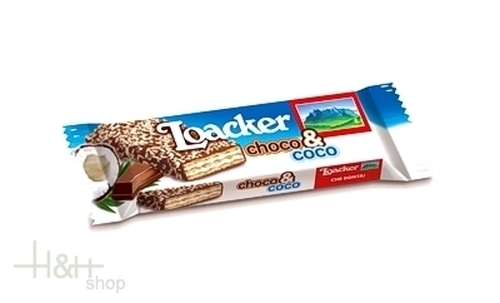 - Loacker 2,55 EUR / 1,46 €/100 gr.